A favicon (universal term) or Site Icon (WordPress terminology) is short for favorites icon. It is an icon associated with a website to be displayed with bookmarks, in the URL bar, on tabs, and anywhere else where a website has to be identified visually. A favicon is typically a graphic 16 x 16 pixels square and is saved as favicon.ico in the root directory of the server. You can use a favicon with any WordPress blog on a web server that allows access to the root directories. For more information on Creating and Installing a favicon in WordPress, check the WordPress Codex. To learn more about favicons, read this complete Wikipedia article. For the Customizr theme, the favicon can be accessed from the customizer. Go to Global settings > Logo & Favicon. 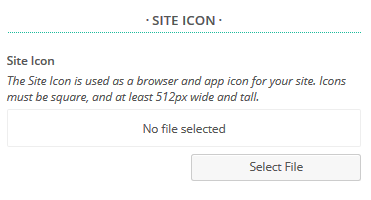 Under the Site Icon section, click on Select File, and choose an image file which is square and atleast 512px wide and tall.